Suggested Use: 4 capsules daily, or as directed by a health care professional. The red-colored yeast Monascus purpureus is a traditional Chinese food coloring and herbal remedy. The yeast is grown on wet white rice, which becomes permeated with the colored yeast. The rice is dried and pulverized and the powder sold for a variety of medical purposes. Red yeast rice is a dietary staple in many Asian countries and may account for the low level of cardiovascular disease found in Asian populations. Modern RYR supplements are usually extracts of Red Yeast Rice called “Xue Zhi Kang” — unneeded starches and gums have been removed to make the powdered product more potent, less perishable, and easily dosed. The dried yeast contains a family of compounds (‘monacolins’) that are similar in chemical structure to the expensive ‘statin’ drugs for high cholesterol. It also contains other medically active compounds that contribute to its benefits. Clinical studies have shown that RYR supplementation can reduce LDL cholesterol and triglycerides by at least 30% in patients with high lipid levels. In a 2003 animal study an extract of RYR actually reduced the size of atherosclerotic plaques in arteries. RYR, like the statin drugs, suppresses the body’s levels of CoQ10 (coenzyme Q10, a substance required for metabolism). Users of RYR should therefore also use a CoQ10 supplement (such as LifeLink’s CoQ10 capsules). The red-colored yeast Monascus purpureus is a traditional Chinese food coloring and herbal remedy. It has been used medicinally in China for at least several hundred years3 and has been a food ingredient for about 2000 years. Accordingly, we will limit our discussion of Red Yeast Rice to a brief summary of recent research, and let you draw your own conclusions about what medical conditions it may be effective in treating. Vitamin E has many of the same effects on cardiovascular disease as RYR, as has been shown in a number of clinical trials.9 But vitamin E acts through a different mechanism than RYR. It therefore makes sense to use these two supplements together to take advantage of synergistic effects. Several of these are now available as generic drugs, at prices around $20/month. Red Yeast Rice extracts cost even less than generic statin drugs. For example, LifeLink’s Red Rice Yeast Extract costs about $17/month. These cost comparisons do not take into account the cost of dealing with side effects. It should be kept in mind that the statin drugs, whether brand-name or generic, contain fairly high dosages of single substances and therefore have more serious side effects than RYR which contains low doses of many active substances. RYR, like the statin drugs, suppresses the body’s levels of CoQ10 (coenzyme Q10, a substance required for metabolism).20,21 Users of RYR should therefore also use a CoQ10 supplement. 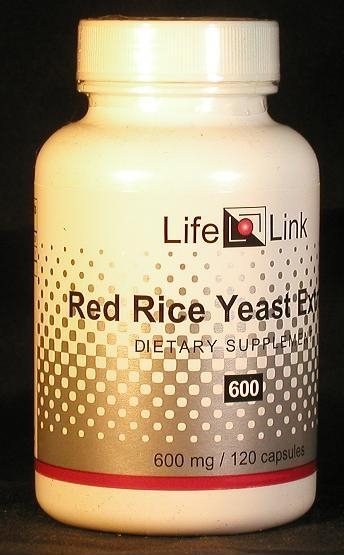 For a good overview of the subject of Red Yeast Rice, LifeLink recommends the following review articles: footnotes: Patrick,9 Heber24, Raloff25, Wikipedia1, Lee26, Zarkov27. Are Red Yeast Rice supplements effective for preventing or treating cardiovascular disease? We aren’t allowed to tell you, so you should take a look at some of the references cited here, and then decide for yourself. Methods and compositions employing red rice fermentation products U.S. Patent #6,632,428 Mao Liang Zhang, et al. Cholestin inhibits cholesterol synthesis and secretion in hepatic cells (HepG2). Mol Cell Biochem. 2002 Apr;233(1-2):153-8 Man RY, Lynn EG, Cheung F, Tsang PS, O K.
 The role of maternal toxicity in lovastatin-induced developmental toxicity. Birth Defects Res B Dev Reprod Toxicol. 2004 Jun;71(3):111-23. Lankas GR, Cukierski MA, Wise LD. Red Yeast Rice and Cholesterol - A Critical Review MedicineNet.com website Dennis Lee, M.D. [Red Yeast Rice questions] iLifeLink.com website Alexis Zarkov, Ph.D.